Triumph has launched the new Tiger 1200 in India at a price of Rs 17 lakh (ex-showroom, Delhi). The bike is available in India in only the higher spec XCx variant though it comes in six variants abroad. Triumph have spent four years developing the new Tiger 1200 and the new iteration features more than 100 improvements across the board. The main focus was in arear of weight reduction, better low-speed manoeuvrability and a more tractable motor. The XCx loses over 5kg weight over its predecessor. Overall the design remains unchanged baring for a few minor updates like the slightly redesigned fairing and a metallised tank badge. It also gets LED headlamps and DRLs. Bells and whistles come in the form of a new 5-inch colour TFT screen as the instrument cluster. Ergonomics have been revised for a more upright and comfortable riding posture. The 1215cc motor's power output remains unchanged. It still makes 141PS and 122 Nm of torque. The six-speed gearbox features a slipper clutch and sends power to the rear wheel via a shaft drive. Rider aids come in the form of an electronically adjustable semi-actve suspension, updated cruise control system, traction control and cornering ABS. It also gets six-power modes including the new Off Road Pro mode which allows the rider to switch off all electronic assists and ABS. 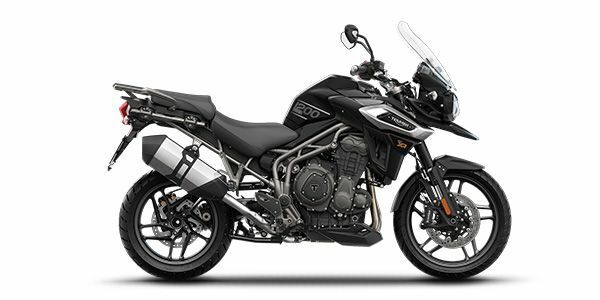 The new Tiger 1200 faces competition from the BMW R 1200 GS and the Ducati Multistrada 1200. Triumph Tiger 1200 prices start at Rs. 17.00 lakh (Ex-Showroom). Triumph Tiger 1200 is available in 1 variants and 3 colours. Share your experiences with Tiger 1200? The new Triumph Tiger 1200 is here with more power, less weight and a host of new features. How is it to ride?